Sing and create actions to go with the song. Round and Fat Show a fat snowball with your arms. The first time you sing, make a giant snowball. The second time, make a medium sized snowball, and the last a small snowball. Sing and pat the beat. At the end of the song make a snowman pose. Accompany your singing with C and G (or D/A, F/C) on the barred instruments. Play a finger cymbal in the rests. The teacher models tapping on the beat chart. Sing and tap the beats (boxes). Find ways to model the tapping as many times as you can. 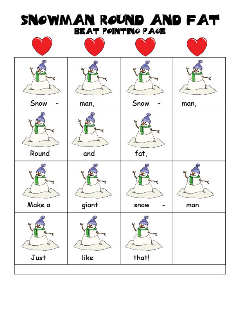 Give each of the students the Snowman Beat pointing page and a pointer. You can use a craft stick, witchy fingers, or stir stick for pointers. Sing and have the students point to the boxes (beats) as they sing. You may have to do this for more than one class for them to be successful, especially if this is their first time with a pointing page. When the students are successful, or with an older class, use the high-low, rhythm pointing page. Sing and point the boxes. Some have two sounds and some have one. Are there some boxes (beats) with no sound? Draw a rest in the box with no sound. 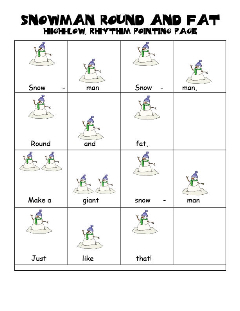 Draw one line in the boxes with one snowman. Draw two lines in the boxes with 2 snowmen. Sing and point to the higher and lower snowmen. If you have labelled so and mi, have them draw an s on the higher snowman and a m on the lower one. Sing the solfa. This entry was posted in News on December 13, 2012 by .